The surface seems clean at first, however, the use and reuse over time creates layers from the past. Palimpsest is a collection of images, which span three years, developed with care to preserve what time has created. Laura’s work started from a need to take time to develop images of not just strong content and technique, but to relax from the systematic cycle of the academic world. Once Laura finished her education, she said, “I was able to get back to my natural rhythm of producing work.” Palimpsest is a collection that deals with lost, memory, and the present. 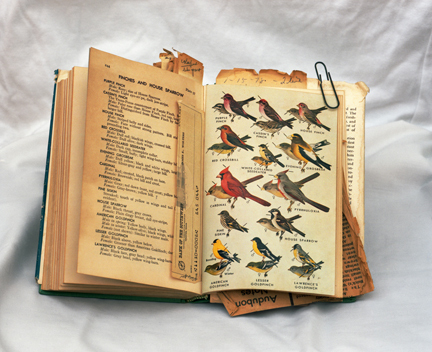 The viewer is invited to exam up-close the worn pages on the book on birds laid on a white batting material to protect the pages as each falls apart-the delicate memory of an interest in bird watching. The objects are all viewed in this fashion, so the viewer is a part of this visual examination. The viewer is invited to view the used wooden spools bundled with a worn string with warm rich colors of browns to tans reminiscent to an era before plastic and mechanical systems. The development of crafts to create the spools on a lathe continues the memory into the present. Laura’s connection, “My grandmother was a child of the depression and she collected things. She passed away suddenly and she had a lot of stuff. 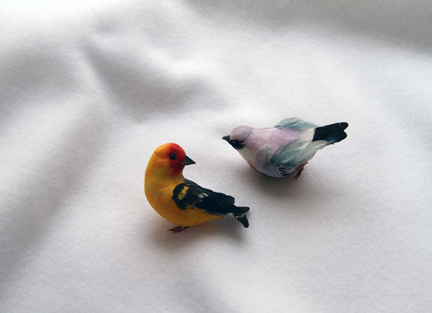 My grandmother was a shut-in and she loved to watch birds.” “Also, I have an aunt who collected my grandmother’s hair after her hair was cut and my aunt took my grandmother’s hair and made pin cushions out of my grandmother’s hair to give to the surviving siblings.” The image of the bird fabric pin cushion with the thin strands of hair is a personal recollection to the past. The relationship of people and their connections with personal remembrance with family is related on various levels of life. 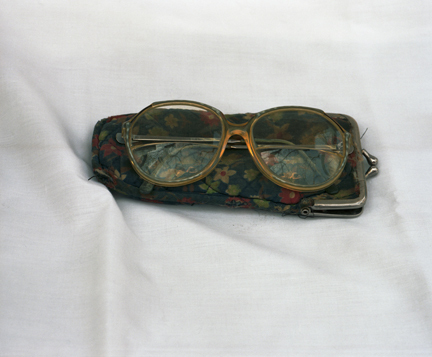 Once Laura photographed the collected objects, she was able to release them and move on to something else. The reason for keeping anything is personal or there is no real reason at all. Laura’s image of the two highball glasses with red wax, are an example. The texture of the wax on the glass with the white background has a distant and reserved unity. The collection overall takes the viewer through a journey created in momentary views of memory which cast a faded imprint on the viewer’s mind.